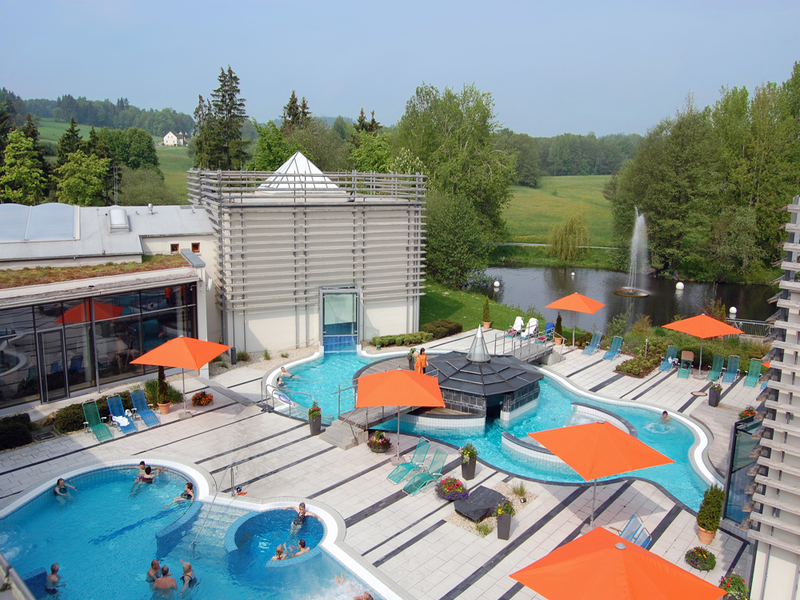 The health and wellness experiences are rounded off by the Spa Bad Steben. The motto is: Enjoy with all your senses. 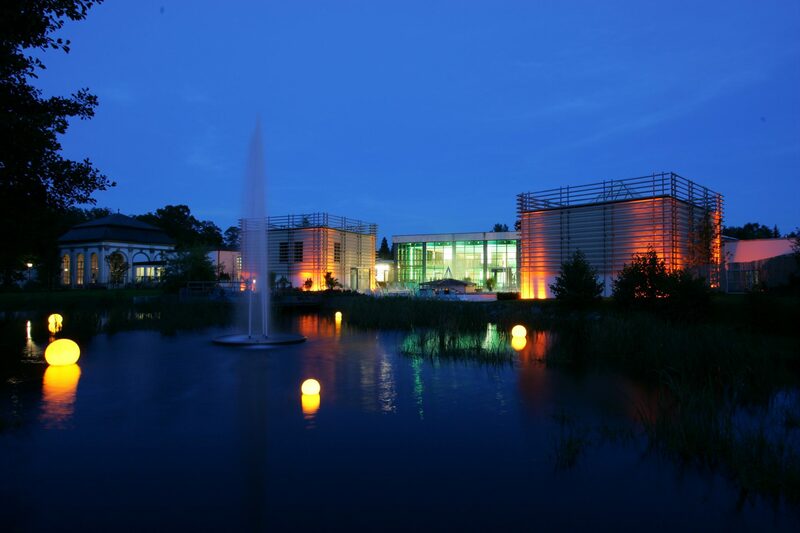 With unique sound and light experiences in the water worlds and in the sauna landscape the Spa stands out from the Spa landscape of Germany. Bathing pleasure, beneficial sauna fun, health care and culinary experiences turn your stay in Bad Steben into a relaxing timeout for body and soul. The large bathing hall with whirlpool and lounge gallery, the 36°C warm relaxing brine outdoor pool with bubbling loungers, the spacious outside water channel with Fragrance Grotto and champagne loungers - the spa offers numerous water attractions. In the „Vital Hall“ with multifunctional therapy pool where AquaFit, Aqua-Biking or Aqua-Jogging is offered, the active guests get their money’s worth. Special highlights are the „Pavilion of Feeling“ and the „Pavilion of Listening”. Music and sound are connected in the “Light & Sound Pool” above and below water to form an integral experience. The „Echo Tower“ with impressive resonance effects, spectacular laser show and the sound showers create a really fantastic atmosphere. The “Pavilion of Feeling” abducts you into tangible worlds of experience, e. g. in a steam grotto made from local shale or under tropical waterfalls. In the sauna landscape a Finnish fire sauna, an infusion sauna, an earth sauna, a organic herbal sauna, an aroma steam bath, a comfortable fire place corner, the spacious sauna garden and natural bathing pond with a relaxing wooden terrace guarantee pure sauna pleasure. A noble lounge, a slate mine with hammock and a salt grotto offer special relaxation experiences between the sauna sessions. The Wellness Dome of the spa is an additional highlight for health conscious people: a salt water grotto with salt saturated air clears the respiratory tract, a Kneipp facility with an additional arm contract bath boosts the circulatory system and strengthens the immune system. The salt water floating pool with underwater music and the salt water lagoon promise healthy wellness experiences. A further highlight is the sand-light-loggia: warmth, light and visual stimulus as well as lying in the warm sand form a symbiotic relationship. Enjoy your health experience in a perfectly relaxed way.